Have you ever felt like the paparazzi with your camera? So far, my kids love the camera. My biggest problem is when they realize that I have it. Then the something simple and cute thing that they were doing disappears as they go over and above trying to create what they see as an even “better” picture for me to take with the camera. And as much as I love red-eye reduction on my camera that light is a dead giveaway that Mamma’s got the camera out. Some of my pictures I feel are Front Page news. Other times they are more of a section B,C, or D. Or perhaps the backpage even. But the pictures I take have stories behind them. They are important to me. And because they are important to me, they are important to my family. We have lived away from family our whole marriage. Now granted I know anything that is less than 5 hours probably have some of you thinking yeah you don’ t have it bad, I do. We have been lucky that even in bad weather that is probably as long as we have to be on the road for. But I’m getting tired of it. And with the continued uncertainty of the future we can’t help but hope we will find a job closer. But until we do, right now we have to travel. Which means that we do not see family all the time, they do not get to share in our joys, in our pictures, and in our daily lives every day or even every week. That is part of the reason why I started scrapbooking. To capture the stories and the miracles that I see every day. So they can be shared either with family now, or family later. I want the time that I spend scrapping to tell a story of what is going on, what miracle I’ve seen in my children or through their eyes. And yes, I’m writing this as much for me as I might be for those of you reading this. 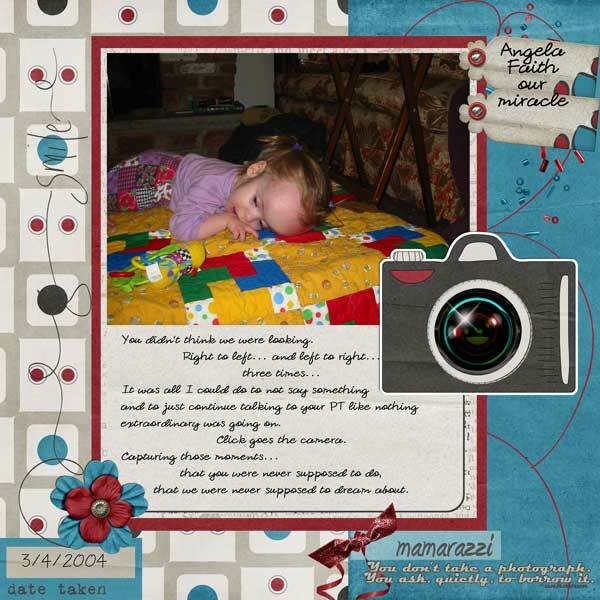 The latest kit that has been put out by Sweet Tomato Designs has made this easy though. I have to be honest, I took my basic page from another layout that I can no longer link to the kit for because not all of the designers are designing anymore. But in recreating this page from a new kit, that I can link to it reminded me of my epiphany up above of why I scrap. And I needed that reminder right now. Sometimes we need to take a step that is unexpected. And mine came honestly as I began writing this post. It was not what I expected to come out, but is obviously something that God is trying to get me to listen to. Otherwise it would not have flowed so effortlessly from my fingers into my keyboard. Anyways… The latest kit is called, as you probably guessed, Front Page and you can buy it at Funky Playground Designs, here. And here as I’m sure you’ve been waiting for, is my layout that I recreated with it. In this picture my first daughter was having a PT (physical therapy) session. My camera was always close at hand for her. I still try to now with her sisters but it’s harder since I have now three very capable little ones that can grab the camera where with Angela that was not as likely. We were talking as she was hanging out. And then she did it. She lifted her head, on her own! Here is the journaling if you can’t quite read it all…. “You didn’t think we were looking. and to just continue talking to your PT like nothing extraordinary was going on. The kit has a lot of other great elements that didn’t fit this picture but I’m sure I’ll be pulling it out again to highlight how the camera is ever present in my hands, capturing those moments that I need to remember the stories that I want to tell and want my children to remember.